Looks like even minor bumps are unlikely to get a new Arctic extent max above what it already has. Area seems even more firmly past max. The following plot is derived by applying a light 15 day filter to remove short term "weather" and other noise, then looking at the zero-crossing points of rate of change to determine the min and max dates. The filtered daily data gives a nice smooth annual cycle but obviously does not throw anything out. It uses a window of data 45 days each side of every point with gaussian weighting. I think this is much more representative of the overall state than spotting individual min/max dates which get pushed back and forth by usual short term pseudo-cyclic bumps , especially for max. This should also make the min data less influenced by one particular storm or wind event while still taking any longer term effect of such events into account. I will update this in about a month since there is not enough data past the new max to run the filter yet. Last point here is the Sept'11 - March '12 melting season. I just did some testing with different filter lengths to see how this affected the results. 21 and 30 day filters give lesser variations (as would be expected) but essentially the same pattern for the Arctic melt period. 10 days or less gives arise to several zero crossing in some years. That could probably be fixed but it suggests filtering is too light. However, this does show another interesting feature. With a 6 day filter there are repetitive bumps in the length of season. I am guessing that this is due to the bumps that are visible in March extents pushing the dates back and forth. This shows the effect of varying filter lengths on the result. All fairly consistent, so I conclude the result is sound. There does seem to be a biannual alternation which would correspond to the 1 year anti-correlations that crandles mentioned is noted in the literature. 1989 seems to stand out. It is the only year that all filters show exactly the same result and at a value that stands out. What happened in that year such that the min and max were so clearly defined and the melting season so long? There also appears to be a kind of ramp and drop pattern of about 10 years length. Maybe it will ramp back up towards 0.5 in the coming decade. If you haven't already, you should probably take a look at the analysis Tamino has done. Take a look at all 3, not just the first part linked below, it includes looking at the way in which the melt season has changed. For comparison here's the main melt season indices for CT Area, length of melt season, and area loss from Max to Min. Being a simple and slow chap I prefer the simple approach, although I do see the value in your approach. In the above graph the left hand axis (blue plot) is length of season in days, the right hand axis (red plot) is the difference between daily maximum and daily minimum within the stated year. Perhaps due to your treatment, or perhaps due to the use of extent (which I don't use), 2012 sticks out as one of the two shortest seasons in this simple approach. The post 2007 increase in area range is also apparent. I second Richard, Tamino's posts are required reading. For all quantities I’ll use monthly averages, which gives plenty of time resolution and enables us to study the annual cycle itself, as well as trends for different parts of the year. plenty of time resolution?? Right. He's going to study the annual cycle by lumping into 12 unequal months and removing the annual cycle to get an anomaly. Perhaps he is not aware of how the circa 15 day "bumps" may alias with his monthly resampling. Perhaps he does not know that averaging is a valid way of removing random noise, but does not work for repetitive components in a signal. There are other issue with his use of fourier analysis. Sadly, it is impossible to discuss anything with Grant Foster unless you agree with him. Even the most innocuous comment that is in disagreement will not see the light of day on his "Open Mind" site. That belligerent attitude means his work is not checked or verified and scientifically invalid. That is unfortunate since he does seem to have a basic technical ability. Ah , right, I see where he's coming from. That explains a lot of his attitude. More motivated by politics than science it would seem. In any case without discussion and criticism it's not science. I won't spend much time scratching my head over his plots. I've just rerun my length of melting using CT's ice area. Similar results though not surprisingly less variation and perhaps less predictably more evenly about 0.5 mark. Recent downward tendency seems the same. "For comparison here's the main melt season indices for CT Area, length of melt season, and area loss from Max to Min." Chris, what's the origin of that graph? Does say much with an explanation. significant differences with my results (though similar at the end). I'm guessing that all they've done is take the one day in the year max and one day min. Then take the difference in dates and area. Pretty basic if that's what it is. But again I'm only guessing without something else to say how it was created it really does not mean much. I really don't think it is the most effective use of this detailed satellite data to just pick out two days out of 365 and dump the rest. Last year a late bump put the max forward about 14 days. A strong wind can make considerable difference to when the ice bottoms out. Filtering allows to see the year to year changes underlying weather. I'd certainly like to know if anyone can see a problem with my method. Unlike some , I welcome criticism and validation. Here's melting season derived from both area and extent data. Surprising how closely they follow each other. I'd expected a lot more difference. Again, it strengthens the result. Now what does this tell us? Any thoughts on interpretations? What can we derive from these graphs? The main concern is how will the new greater open sea area and larger annual swings work out. In the plots, I'm seeing a similarity now with the 1995-2001 pattern. My guess is that this years dot will finish the "W" and end up around 0.490 to 0.495. The alternating pattern would definitely suggest it will go upwards. I think the lack of a significant late bump will work in that sense too (it indicates the underlying peak has already passed). It would also argue against run away melting. Less ice cover leading to a shorter melting season suggests negative f/b rather than positive. I'm still curious about 1989. It really stands out as being exceptional in the record. Both extent and area with whatever filter length. It must be significant. Anyone know anything about that? Seems a little early for concluding that it argues against run away melting. e.g. Have you looked to see if there is negative correlation between length of melt season and area melted which Chris's graph seemed to suggest? Even if there isn't negative correlation, melt season length might be an insignificant effect with rate of melting continuing to increase due to trend towards thinner ice. Last winter we discussed possibility that as ice edge moves north then the sun is at a lower angle and this could cause melt season to start later. The ice could get thinner and thinner and melt away faster despite the later start to the melt season. Good idea. hopefully it will show something. It's true Chris' plot does seem have a fair neg. correlation. Was that Chris' own plot? I didn't realise. He referred to "indices" I thought it was some established index from somewhere. I've had enough screen for one day, I'll take a look later. What 15 day bumps? I see no problem in any of Tamino's handling of the data. You object to my using specific days, then you balk at a monthly average? Your further snide comment about Tamino is to the detriment of any technical argument you may have. Your use of a fellow internet user's real name, when said person has chosen a pseudonym is downright rude. That said you have made your position and motivation quite clear. The link to an image I posted is my own calculation, it is adequately explained in the post in which I linked to it as you have seen having noted the link there. Your claim that in using daily values I am throwing away the rest of the year's data is fatuous, the variations near the minimum/maximum are small compared to the annual range, and both are the result of previous impacts on the ice, this is especially the case for the minimum. Let's compare my simple approach to your effort. My calculation reveals no recent downward movement. 2012 is an outlier, with 2010 and 2011 being in the range of preceding years. Yet you find 2010, 2011, and 2012 being short melting seasons. Are you quite sure you have centered your filters? I ask because around the minima 2010/11/12 are flatter than other years - and yes I've done the analysis. If you are using a lagging filter it will lag the day of zero crossing due to this flattening. In order to replicate your method I need more information. You say you have used a 15 day filter, then say you have used a 90 day Gaussian filter. Can you clarify? "Last winter we discussed possibility that as ice edge moves north then the sun is at a lower angle and this could cause melt season to start later. The ice could get thinner and thinner and melt away faster despite the later start to the melt "
Also IIRC we discussed the possibility that the melt season could end earlier due to the more northerly edge of the ice slipping into darkness sooner. If, rather than timing the entire melt cycle we started the clock when a certain area or extent was extant, then stopped the clock when a certain amount remained we'd see the kind +fb shown in Jim and Seke's annual graphs. Timing the full melt season and concluding that a negative feed back is at work is ignoring the geographic reality of where the ice edge is in relation to the pole. I did not say 90 day gaussian. It is a 3 sigma gaussian with sigma=15 days ( ie 45 days of data each side of calculated point). Yes, sure, it's centred. There is a small but significant cyclic component present. Sub sampling at a frequency close to a multiple of that (cf 15 , with 28/30/31 days) will alias. In order to sub sample you need to apply an anti-aliasing filter first. Failing to do so could introduce significant spurious signals into monthly data. That's the very basics of DSP. I'm not knocking your approach as a first approximation ( as I noted above I didn't actually realise it was your plot , I thought it was one you dug up from somewhere else) but I think the data has problems that require a more technical approach. OK, to be fair you are using the data in the immediate vicinity. However, it is precisely because the variations are small and a significant amount of "weather" noise and other unidentified noise is present that taking the spot minimum is very sensitive to error. A small noise can lead to a large change in the perceived date of the min/max event. I try to address those issues by suitably filtering noise and short term weather. I'm trying to avoid having to argue about whether a certain storm was "the only reason" for an early/late min/max event. And I'm trying to correctly remove the fortnightly bumps to see the underlying annual cycle. The fact that I get essentially the same pattern with a range of different filter widths and very similar results with both area and extent would seem to suggest the result is "robust". My calculation reveals no recent downward movement. 2012 is an outlier, with 2010 and 2011 being in the range of preceding years. Well I'm not sure I agree with that reading of your graph. It presents a very similar downward tendency to my area based graph. The proportional change is mine is rather smaller due to the filtering but the shape is quite similar. The major differences I see are yours peak strongly in 1997 and does not show the very definite spike I get in 1989. I would like to understand why that is. Was there anything unusual about 1989? I think it was end of an El Nino phase and was immediately followed by La Nina that preceded Mt Pinatubo. I have not dug into Arctic details for that year yet. That spike is one thing that is rock solid across all the runs I did and even with heaviest filtering it remains about 15 days longer than surrounding years. I'm wondering if there was not a satellite change over of something around the time. It looks like an outlier to me. The fact it is so constant when other years shows variations between plots makes me suspicious. Was your data source the same as that which I marked on my graphs? Could you explain the above paragraph? A melt season shortened by the northern movement of the ice edge, but that melts more ice by every metric hardly seems indicative of a negative feedback. Run away melting is what we see year after year, decade after decade. Run away melting is what we see year after year, decade after decade. A positive feedback leads to accelerating melting, not just continued melting. You appear to confuse the two. Look at the rate of loss (area or extent) since 2007. It is less than pre 2007 period. That suggests either a neg. f/b or some unaccounted for external influence ( or both ). I'm reconsidering the comment about feedback in light of crandles point above and I'm redoing my processing to produce area change as he suggested. Seems a little early for concluding that it argues against run away melting. e.g. Have you looked to see if there is negative correlation between length of melt season and area melted which Chris's graph seemed to suggest? As I said, you raised a good point , so after some fiddling here it is . Now, I already said I regard 1989 as a suspect flyer ( 'nasateam' dataset has a change in magnitude which I seem to recall doc says was due to satellite or instrument changeover, needs digging. I guess CT have done their best to adjust but I think this is an artefact). So I'll ignore the 1989 glitch for now. Other than that its actually pretty close to Chris' plot ( which is reassuring ) . In fact, I'd say there's a closer correlation , especially 1997 to 2007 period. This does not surprise me either if there is a relation because I would expect my method to be more noise resistant - that was whole point of going to all that effort. It also shows the same divergence that Chris dismissed as a one year outlier. What I think this plot clearly shows is change in behaviour post 2007. This is not particularly surprising in view of the large area of open sea now expose for a fair part of the year and the greatly increased annual swing compared to 1997-2007 period when it was the smallest of the record. It may be a bit soon to draw any real conclusions but it looks like it should tell us something. I expect those two will come back together a bit when there's enough data in for the next dot. But not taking any bets. Thanks to crandles for questioning my feedback comment and suggesting this plot. It helps to reconcile with Chris' spot min/max dates method and looks to give a bit more information. I don't pay much attention to extent, but I checked melting season length for volume before. It looked random to me. There is only real data for volume for two years. And even then they only seem to have published 7 dots per year which does not allow proper determination of the extrema. The rest is models. That may be roughly OK but certainly not accurate enough to start getting a sensible min/max point and work out melt periods. My source data is CT Area. There is no 15 day cycle that would alias with his 1 month average. Here are the fourier coefficients (power) for the first 20 days. The large figure for zero is due to the large offset from zero. The overall downward slope is due to the overall declining trend. The peak is at 12 days not 15, indeed 15 days is a local minimum. Of interest is that there is a small peak around 365 days, and both real and imaginary components show negative troughs around 730 days, which is to be expected given the 1 year lag negative autocorrelation. I'm not interested in discussing Mr T , or his work but if you have some frequency analysis of your own to present and you are willing to discuss techniques used , no problem. The overall downward slope is due to the overall declining trend. Which is why it is necessary to test for stationarity before doing FT analysis. Most of what you are looking at is indeed the FT of a slope, how are you to distinguish what this tells you about the rest of the signal? Econometrics/statistics usually recommend taking the first difference as a means to make the data stationary. Indeed this is pretty much essential with climate data which is strongly AR1 in nature. First diff of AR1 process is stationary so that's a good start. Another technique more typically used in electronics and acoustics dsp is windowing, though some though has to be given as to the inevitable distortion caused by window function. In acoustics this is not generally a problem because the sample can be many times longer that the lowest period to be analysed and the window does not do much damage to the bit you want to study. That is less the case for climate, though it would not obstruct looking circa 15..30 day frequencies. There is clearly some pseudo cyclic repetition visible in the signal of roughly 14/15 day length , it would be a useful and interesting exercise to try to identify it. It happens every year and most clearly seen around March max, as in the links I provided above. It could be "random" in phase and not necessarily a tidy harmonic cosine but I suspect there is something regular behind it. That's my gut impression from visual inspection, yours seems to be the opposite. So if we can share knowledge and agree on our techniques and method, it should be interesting. Here are the fourier coefficients (power) for the first 20 days. The large figure for zero is due to the large offset from zero. Agreed about the zero and nice well defined peak at coeff 12. Fourier coeffs are usually powers of 2 , 1 per day ; 0.5 per day ; 0.25 per day. How are you generating these values to have equal period spacing rather than equal frequency spacing? 11 day 9340.8 looks larger than 2356.2 for day 12. Sorry about that, it was a very old spreadsheet and I'd used the wrong column to scale the results when posting here. I'd originally not detrended because I was only looking for periodicities. Here's the spectrum of sea ice, source data from 2002ish to present, 4096 points, wrap around ditched from graph, geometric sum (sqrt of sum of sqrs) power series, original FFT produces complex results. Detrended by differences, this eliminates the seasonal cycle, which is not ideal, but I'm afraid I'm too busy to detrend using a residual fit. 15 day periodicity marked by red line. Conclusion - 15 day periodicity is negligible for Tamino's purposes. Out of interest; is the decline in the melt season length due to summer or winter shift, or is it a complex mix of both? How can that remove the seasonal cycle? You should have a circa 365 day spike that is maybe two orders of magnitude bigger than anything else. [Edit] OK did not notice your log scale, my bad. I see at spike that is >1 order bigger , looks correct. Why are you saying it's removed the seasonal cycle? My 15 days was just a stab in the dark from eye-balling the time series but it looks like it was pretty close. This is not a major component in amplitude but it is big enough to affect when the max falls (eg last year a late bump gave a late max. ) That's one of the things I was hoping to eliminate when trying to assess the length of the melting freezing seasons. Hence the more complex method. One thing you may like to check is the irrgularities in the CT dates. Most leap years have a dupe date et the end of Feb , then are a number of other anomalies as I noted on another thread here. Since there are the correct number of days in the record I just redated everything with equal spacing. I don't know if this is correct since there is no doc with this data and they do not even reply to email. If there is some fancy correlation to satellite orbits I don't know. In any case the dupe dates are clearly a mess and redating seemed the most logical option. I could ignore the irregular intervals but dupe dates needs to be dealt with. Not really applying myself to it, there will of course be a shift in negative to positive values with shift from melt to freeze seasons. Indeed, I just did a quick dft and there are several notable spikes at roughly 6,8.5,12,15 .... no clear outstanding frequency that could account of a cyclically regular bump most of which seem to be harmonics of 1 year: 1/43.. 1/60 etc. So I'm inclined to think they are a combination of a lot of things, artefacts or just noise. There is 15 days and general rise centred around 14.5 d, that suggest some lunar influence but I doubt that it is really that significant. (May be more apparent in a more thorough spectral density plot). Either way this reinforces the need for a more technical means of determining the length of melting period than just spotting min/max dates. That was my basic premise in doing all this as I stated above. Sure a simple method is better if it is sufficient and not too simple. Chris , would you agree, having seen all that grec in the spectrum and the bumps around annual max, that a more complex approach that removes short term weather/noise would be likely to give a more stable and reliable indication of the year to year variations? Before I started posting anywhere, while I was lurking and reading, one of the things I wanted to do, amongst other things, was to look at lunar influence and an FFT seemed like the best approach. So I did a routine using decimation in frequency algorithm, only to find out months later I could have installed the analysis tool pack. That's the root of the initial spectrum I posted, it's years old. Anyway the lunar influence is, as you note, not great in the large scale. Although from watching coastal flaw leads open and close I do think if one analysed those a far greater signal could be seen. I use waterfall diagrams at work (frequency vs time with amplitude as colour), and have used them previously analysing radio signals. Perhaps such an approach would be of use on the entire daily series. Here's one such waterfall diagram - can't recall what it's from though, looks like 4 time slots and rather a fat control/overhead slot. With that kind of approach you can pick out frame and hyperframe structures even when receiving advanced modulation (like QPSK) on a standard comms receiver in FM mode. However if doing that I still think that removing the trend but leaving the full amplitude of the seasonal cycle would be best, I'd have to read Tamino's posts again and try things out. If you'll note, I haven't varied from my original response that what you've done looks interesting. I do agree that more advanced approaches may be of use, which is why I seconded Richard's suggestion, but I will let that matter drop. However I am all too aware of how rusty I am, and of how prone to error I am the more complex things get. Wipneus has made more progress with the gridded PIOMAS data than I did in. For what it's worth, my idea about changes to the base of the annual cycle didn't pan out. There's been a broadening but it cannot account for your findings. I have a couple of ideas I want to try to refine a little what I did. The various filters seems to converge by the time I get to 20d so I'll probably stick with that value. It was quite interesting to see such a close correlation between the two lines from 1997 to 2007, I did not expect that. It also makes the divergence more interesting. Are you aware of any documentation for the CT data? I need to research the 1988 issue. I'm pretty sure its a data discontinuity but I'd like a ref. to what actually gets done and to what before deciding whether the earlier stuff should be on the same graph or not. It may be enough just to mask out the flyer in '88 but again that needs a documented reason. Still not sure what to read into the post 2007 divergence. I will have another dot in a month or so , so maybe the pattern will become clearer. Just for a bit of fun, my guess is 0.49- 0.495 and 10.25-10.5 on the 20 day plot. Don't know of any documentation. Are you sure it's 1988? I ask because it looks to me like 1989, and if it is: 1989 had a Dec Jan Feb AO index of +2.69, ~+2.5 sigma, the highest since the 1950s when the series starts. Thanks Chris. I'll look into that. There is a strong relation between N.Atl SST and rate of change in ice (not too surprisingly). That event could account for the glitch. I seem to recall the change in data I'd seen happened near year end but I can't recall if it was exactly year end or may have run over into 1989. It was my concern that it may have affected the March max but not the min. It's unfortunate that CT don't provide some proper scientific documentation to back up the pretty pics. I don't know whether they've published anything about how they generate their daily time series but if they have it should be linked on their site and there's nothing there. I don't like "detrended" indexes, since just about everything in climate responds to actual temperautres not detrended ones or anomalies I prefer to stick to real data. However, a quick look at AMO shows considerable similarity to my length of melting season graph. I will have a look at N. Atl SST in this respect. Good suggestion. AO and ice area have similar variations so that is a good indication that the spike is legit. I decided to look at first difference of melt season and how it changes. It's quite interesting. There is a strikingly strong correlation between melting season length and its first diff. Equally at the end it seems about right. ie a significant positive feedback. But this is not the whole story (obviously) . If we look at the 1989 spike we see the initial first diff follows the positive feedback rule, bang on. However, after that , we see a clear negative feedback and what looks like an exponential decay. Negative rate of change (diminishing in amplitude) and the melting season falls back towards its base line with what looks like a 1/e decay rate of one year. The baseline I marked is zero for y2 scale of the diff. 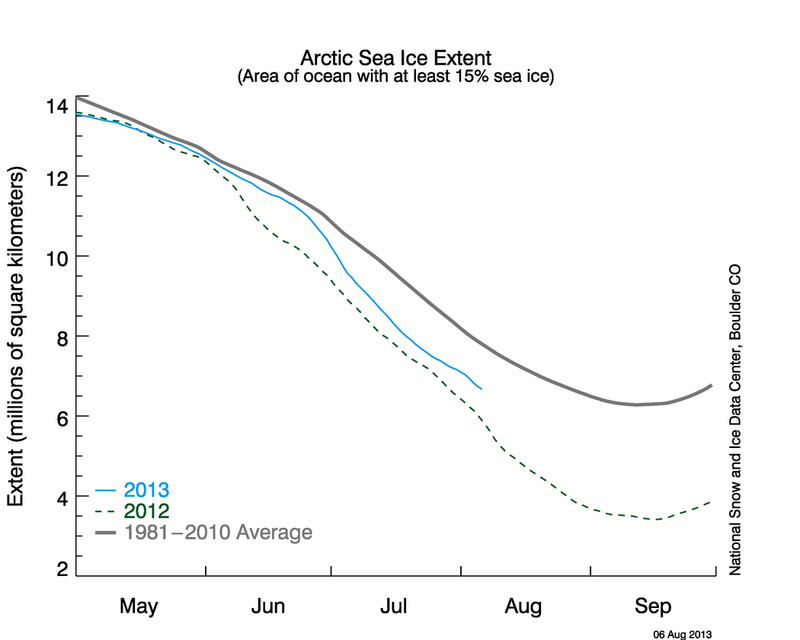 but the position seems quite close to the baseline of the melting period too. About 0.486 years. A positive feedback related to the full melting season length (circa 0.5) and a strong negative feedback that tends to return it to a base value which for this period seems to be a little below 0.5 years. I'm interpreting the AO event that Chris pointed out as an external impulse to the system that was strong enough to stand out again the rest of the period and manifest the negative feedback. There are what looks like other externally induced deviations of smaller size centred on 1995 and 2007, these could also be noise driven oscillations due to the +ve feedback. The positive feedback is making the system tend to oscillate and this probably is at the origin of the one year anti correlation that crandle pointed to. That's just my reading , perhaps others read something else but I may see whether I can model it that simply. Any thoughts/speculation about the what physical nature of those feedbacks might be? I thinks it's more important to verify this speculative analysis before rushing off and looking for specific causes, thought that would not be difficult. Looking for mechanism before having clearly identified the effect seems a) pointless and b) likely to impede objectivity. That's one way to look at it. Another is that mathematical analysis without any guiding hypotheses based in physical reality risks over-fitting, being seduced by spurious relationships, etc. Look at what the heliocentric model did for the mathematical description of planetary motions, for example. IMHO being dogmatic in either direction is unwise. It's possible to find interesting relationships in the math and figure out what's causing them later, and it's also possible to use a grounding in theory to formulate reasonable hypotheses for testing, and thereby save the time and effort of finding your way back out of curve-fitting rabbit holes. Each approach has its strengths and weaknesses. The more ice is molten, the more far north the remaining ice is retired. Nothings moving back. the ice is already there at higher latitudes. You're not the first to use that argument here. Any feedback will come from what the ice is replaced with : open water and the changes that implies. It's been discussed elsewhere here recently , so I won't repeat it. However, that may be a reason for the rate of change slowing down since the remaining bulk of the ice is in a geographically more stable position for ice. I found some more recent AO data and updated the graph. My calculated melting season length ties in well the AO index. That gives me confidence that there are no serious anomalies in the underlying data and that I am getting close to a good determination of the melting period. Both seem to follow each other well even after the 2007 event , with more open water etc. This correlation would suggest melt season will be closer to 0.5 this year, as I said in an earlier guestimate. AO linkage is nice since there are short term model predictions for AO. A relevant paper is Rigor et al 2002, "On the response of sea ice to the Arctic Oscillation." I can't find the main paper on the 'net right now, but here's a summary page from the authors. However Stroeve et al 2011 "Sea ice response to an extreme negative phase of the Arctic Oscillation during winter 2009/2010" finds that the 2010 winter synoptic pattern was markedly different from the typical AO pattern used in earlier studies. So rather than retaining sea ice, which may account for your finding of low AO -> shorter melt season, 2010 saw a larger loss than would be expected by the AO linkage. There is another paper that finds that in recent years the link between the AO and the sea ice found in previous studies has waned, it wouldn't explain the post 2010 drop off from the AO plot you've used. I ask because the studies I've read pinpoint winter as the main issue in the following season's melt. This is because the AO pattern is more robust in winter. EDIT - Links to papers about AO and sea ice taken down as they link to my Google Drive and I don't want to breach copyright by keeping them active for longer. Thanks, I have had a scan of those articles but don't seem to be able to save of copy anything off G.
Here another relatively recent paper that makes some attempt at evaluating a date from sustained onset as well as just first date of change of trend. The sustained melt method gives lesser overall "trend" figures. I really hate this obsession with linear trend fitting. There is hardly anything in climate that is in the slightest bit modelable by a linear trend but that always seems to be the way it's summarised. You just can't fit linear trends to a chaotic system and expect meaningful answers. Anyway, it seems that my method may be an advancement on the techniques I've seen published so far. Most of those studies , even if doing detailed regional studies, seem to use a simple "first day" metric. It is interesting to note that correlation looked at lot tighter <=1989 , though it is still good. It's true one could have expected a bigger drop in 2010, though it has not bounced back up yet, so there is some residual effect it would seem. I expect to see it bounce back up around 0.495 this year both from the alternating characteristics and the AO correlation. I'm trying to re-jig my processing to do the same for freezing period but it's being difficult. I could try DJF but apparently AO is pretty much dominated by those months anyway. The daily data with the 0.4 year cut-off filter still shows winter peaks clearly if you prefer to just look at the peak values. That's probably more explicit that making generalisations and then lumping quarterly figures together. I try to avoid that sort of thing. Response to '95 drop was also rather stifled, with some hangover. Not reading too much into an isolated point yet. PS. One reason that published studies are finding less correlation recently may be that they are not properly separating out the noise or other interference. As you demonstrated, using first day only does not follow AO downturn. Larger annual swing and thinner ice probalby makes those variaitons more important, and more necessary to filter out. As commented , pre-90 correl was tighter. More solid ice base, less sensitive to minor influences? Mine seems to follow downturn pretty well. Have you tried File>Download? EDIT - works on my Google Chrome which isn't logged in. "Also some NASA stuff of same era all stopping analysis in 2007 ( even when publishing in 2010 )"
There will be reasons, probably stated in the source papers. "PS. One reason that published studies are finding less correlation recently may be that they are not properly separating out the noise or other interference." Then show it in a paper and submit to GRL. I think the detail of the method is probably worth publishing though I'm not sure I have the time to follow it through. I also object to those big publishing houses making me pay for the results of research that I've already paid my part in funding. Giving them copyright to MY work, free of charge, for them to make more money and charge me again next time I want to read a paper, appeals even less. I may just publish somewhere on-line. I think it's worth writing up, though I'd like to give it a bit more of a grilling first and see what freezing looks like. [Edit] Just added freezing to the plot ( 1 - freezing ) for direct comparison. Obviously it can't drift much either way but since both ends are moving, so it's not just a trivial complementarity. At least freezing will provide another point in a few weeks. OK, this is taking shape. I've interleaved the melting period and (1-freezing) periods , logging each period at it's mid-season date. This gives a twice a year measurement of state of ice cycle timing. It correlates very well with AO except for a period around 1993-2000, where it seems to be getting out of phase. It has already noted that there is a one year anti-correlation that gives a tendency to a 2 year internal oscillation. Looking at this part of AO record there is also a rather repetitive pattern compared to the apparently random variations elsewhere. From 1993 to 2002 I count four peaks that's a roughly 2.26 year periodicity. I suspect this is inducing an out of phase resonance with the natural tendency for the ice to alternate with a 2y period. Once this regularity in AO breaks , things come back into phase. This may also account for studies based on data up to 2007 to report weakening correlation with AO. The retained mode of "orthogonal function" , would this be the sort of thing that has end point distortions? I'm wondering whether this upswing will still be there in years time when there's more data either side of it, or whether part of it may the fitted function's over-reaction to the 2010 trough. Now I've added in freeze time that's three points that seem to show divergence. It's starting to look more significant. The AO is typically derived using a loading pattern. Not sure of the exact mathematical procedure, if you email them they can probably point you to references. 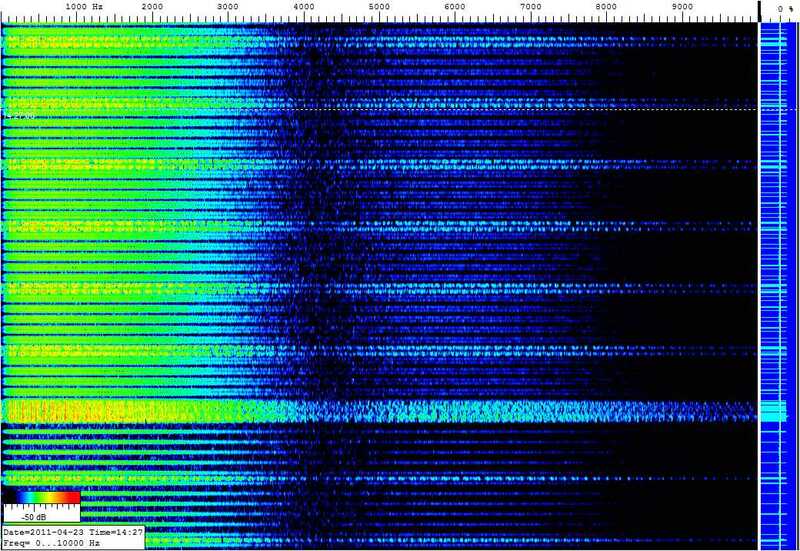 Just got confirmation from NOAA that AO are fixed once calculated. I have had a closer look at the period around 1995 where the correlation seems to break down. There is what looks like a clear rectified harmonic oscillation, with a sudden phase shift in 1993. The period that fits that model is 5.38 years. I have also increased the filter on AO to 365 days to see base period of repetition there ( not suggesting this is harmonic, just looking for rep. period). I see three peaks in ~7 years starting 1990 , so about 2.25yr rep.
Now, that half wave pattern is only evident during that period, and that period is when AO is showing an evenly repeated variation. When AO is looking irregular the melting period correlates. In this period the correlation breaks down. I have no idea what any of this "means" but I'm just treating it like a engineering blackbox problem, observing the system response and seeing what I can infer. I'm thinking that there may be a resonant frequency in ice physics that is responding to AO patterns. (Maybe it's the other way around). I'll have to think some more about how a resonator would respond to a drive close to its own fundamental and think what to make of the apparent rectification of the signal. Chris , I think you said you're in electronics, does this make any sense to you?